Doing your level cert? It isn’t going too well if you are now thinking it’s time to start a degree in Comedy. “Dr. … Greg … Photosynthesis … from Cambodia,” the students said, stumbling through the answer awkwardly, like four children stacked inside a large overcoat pretending to be an adult. Needless to say, the sketch wasn’t exactly funny. Its purpose instead seemed to be getting students comfortable making fools of themselves, to embrace their inner clown. 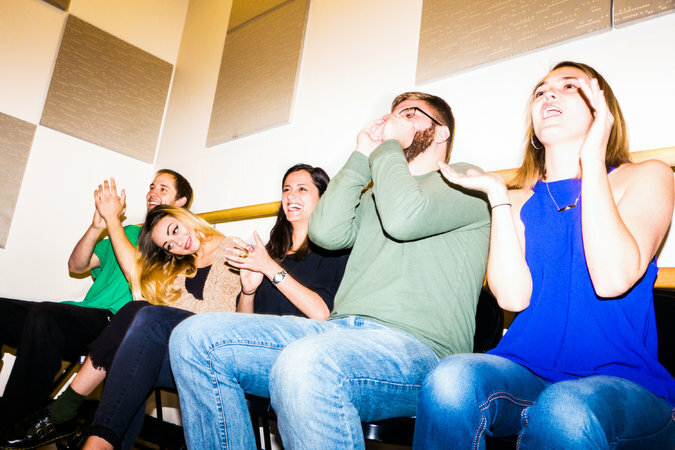 That’s not out of the ordinary for an improv class, but this was no ordinary improv class; it was Performing Improv Comedy, and it counts for four credits. Starting next academic year, it will be a required course for anyone looking to graduate with Emerson’s new B.F.A. in comedic arts, the first such program in the nation. 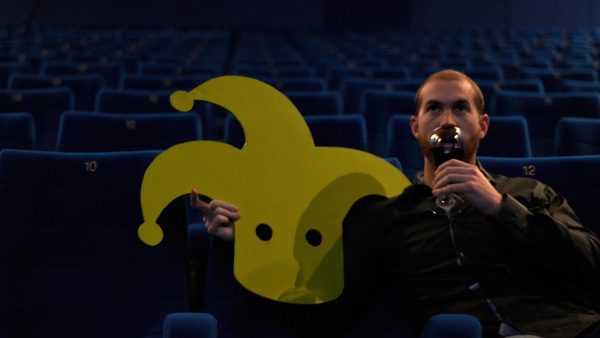 Formalizing the study of comedy into an academic degree may seem like, well, a joke. But Emerson has made strides to pre-empt criticism. The curriculum is heavy on theory and craft, with practical classes like Comedy Writing for Television, Great Screenwriters: Wilder, Allen, Kaufman and Comedy Writing for Late Night, balanced out by headier electives like Why Did the Chicken? — Fundamentals of Comedic Storytelling. 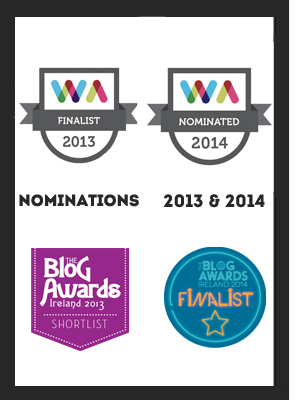 At a glance there’s something absurd about the respectability laundering at work here. While no serious dramatic actor would disavow the merits of acting school and few musicians the benefits of rigorous training, the whole culture of comedy is invested in the opposite. You’ve either got it or you don’t. Humor isn’t something that can be poured into an empty vessel; it’s the product of the vessel itself being cracked open. Nowhere is this more apparent than in the loner mythology that surrounds the stand-up comic, which posits that genius comes only from private pain and public humiliation, each successful comic a grinning Horatio Alger who pulled himself up by his microphone cord. Back around the turn of the millennium, when I was pursuing an ultimately unfulfilled M.F.A. in creative writing at Emerson — something that should probably preclude me from rendering judgment on the economic value of any type of degree for eternity — there was a public debate about the explosion in M.F.A.s, circling around a thorny question: Is it even possible to teach someone to become a writer? That sort of discussion continues today concerning the value of a liberal-arts education in general, particularly as costs have continued to skyrocket. (At Emerson, for example, tuition is $42,144 this year.) We’re regularly reminded of the low return on investment for pursuing study in fields like literature or sociology, and of the excellent return on STEM degrees. And then there’s the slow drip of news reports about absurd courses offered at well-regarded universities; Wesleyan has a class on hipsters, Rutgers offers one on Beyoncé and Skidmore has one on Miley Cyrus. And all of these count for credit toward perfectly respectable degrees: anthropology, gender studies and sociology. In a sense, a comedy degree is either the embodiment of all that’s wrong with student-as-consumer liberal-arts education or a rather canny vocationalization of it. After all, unlike poetry — or journalism for that matter – there may actually be lucrative careers out there for funny people. It’s difficult to quantify the extent of the current comedy boom, but a glance at the statistics provides a sketch of the field’s growth. In 2005, to use one metric, there were only 10 cable and prime-time scripted comedies on air, according to numbers tallied by FX Networks Research. By 2014 that number had risen to 84, and topped out at over 90 last year. According to Nielsen, 7 percent of around 325,000 broadcast minutes were devoted to comedy programs in 2009, a number that jumped to 18 percent of almost 440,000 minutes in 2014. On cable that percentage only rose to 5 percent, from 4 percent over the same time period, but cable as a whole exploded in those years, and that one-percentage-point increase represents almost two million additional minutes of programming. After consistently making her case and laying out the benefits of such a degree, Cook got the approval to design a comedy minor, which began in the fall of 2014, as a sort of trial run to see how the logistics might work and what interest from students would look like. Cook cobbled the minor together from a number of classes related to comedy that were already being taught as part of other majors. When 45 students declared for it this past fall semester, the college realized that the time for a comedy major had definitely come. Emerson agreed to expand the comedy program and made Cook the director. One reason Michaele Whelan, the college’s chief academic officer since 2013, embraced Cook’s idea was a desire to foster further interdisciplinary programs at the college. Another new major, in the business of creative enterprises, will start next year, encouraging arts-focused students to learn how to apply business skills to their artistic practice. Like the comedy major, it applies a career-oriented gloss to a degree that might otherwise be considered risky, or even frivolous. It’s as if they were designed specifically to placate anxious parents. In order to sell the comedy degree to the board, Cook had to make it clear that this was a theoretically rigorous course of study, that can draw on Shakespeare and Freud and other figures of the Western canon – and just a little more Woody Allen than usual. Some courses are more clearly vocational than what you might expect, more like studio-arts courses than anything else. For example, in Comedy Writing for Television, students will enact a microcosm of a Hollywood writers’ room, creating spec-scripts for existing television shows, punching up one another’s work and growing accustomed to the crushing succession of indignities that make up the life of the comedic professional. The first and hardest step toward learning to be funny is coming to terms with how unfunny you are today. The courses aren’t so different from most liberal-arts electives; their narrow focus gives way to more universal questions. For example, the Evolution of Comedy reaches back to antiquity on through Renaissance commedia dell’arte, Elizabethan England and the golden years of Hollywood, focusing on durable comedic constants like the trickster and the fool and the tools of caricature, parody and farce. Another course has students unpacking the texts of films like Mel Brooks’s “The Producers” or Federico Fellini’s “The Temptation of Dr. Antonio.” It’s not just an exercise in close reading, but also a means to connect earlier modes of humor into the contemporary discourse about what is, and isn’t, considered funny. Though the comedic-arts program is brand new, it has roots in a student insurgency in the 1970s. “Saturday Night Live” had recently begun its run, and more mainstream interest in performing comedy was beginning to take shape. A group of students lead by Denis Leary and Eddie Brill started the Emerson Comedy Workshop, still one of the main comedy groups on campus today. In old pictures and videos from the time, the group’s brash confidence, all tight bell-bottoms and sideburns, stands out. Leary had clearly discovered his comedic persona already: He sports sunglasses and a scally cap, with a cigarette dangling from his lips. If the attitude seems a little put-on for a private-school student, Leary says it was necessary at the time. 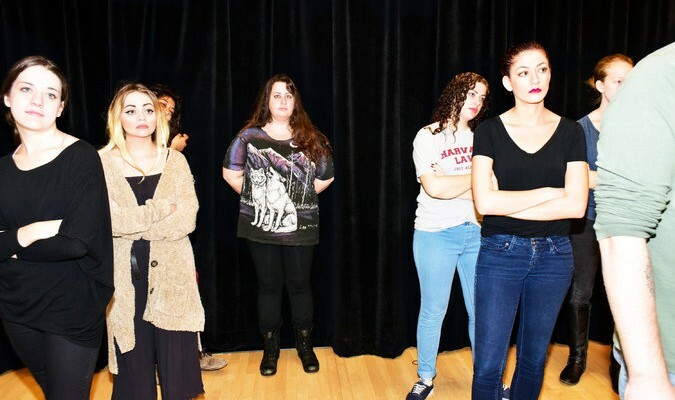 They had little support from Emerson, and the faculty — which preferred the dramatic arts — was actually rooting against them. Brill, a veteran comedian and longtime comedy booker for David Letterman, says that a faculty member from the drama department actually heckled them at one of their first shows. This might have been a one-time fad with no effect on later cohorts of students were it not for one English professor, James Randall, a co-founder of the literary journal Ploughshares and founder of Emerson’s writing program. Randall saw no reason the college should draw a distinction between serious dramatic arts and comedic performance — not merely because of the inherent entertainment value, but because he figured there was little pedagogical difference; both offer the same lessons in writing, performing and production. He helped Leary and company lobby the college to give them funding and academic credit for their productions, and he won. That’s a lesson Bright himself learned while a student at Emerson under the tutelage of Dan Lounsbury, the producer of numerous midcentury radio and television programs like “Your Hit Parade.” After graduation, Lounsbury introduced him to people in Los Angeles and helped him land his first job in the field. It’s a favor Bright has tried to repay to fellow alumni every since. Stay with each other — that may be the most important lesson students pursuing a degree in comedy learn here. Comedy isn’t made in a vacuum. It’s a longstanding, ongoing, transformative discussion, both with the history of the form itself and with one’s peers today. It’s the only art we make naturally with our friends and loved ones, on a daily basis. A college education of any kind is no longer the guarantee of gainful employment it once was, and no student today thinks she’s graduating into a fixed career path. But a comedy career, more so than most others, is a series of ad hoc improvisations and recoveries from repeated failure. A degree like this seems designed to ensure that when they do end up falling, there is a network in place to help students get back on their feet. 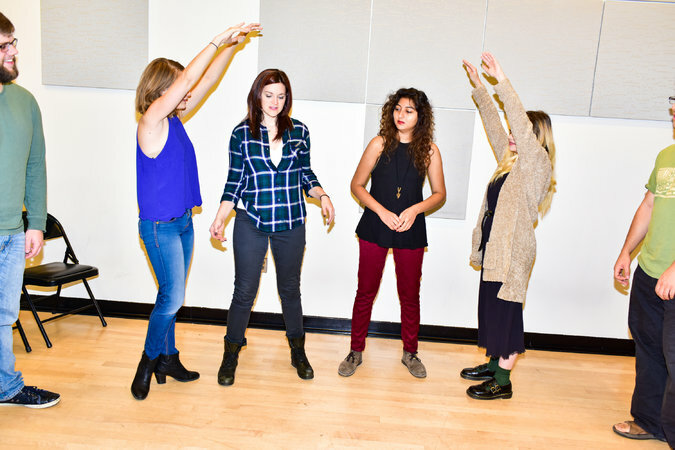 In April, at a performance by Chocolate Cake City, one of the many campus sketch-comedy troupes, a group of students further along in their comedy training put that theory to the test. 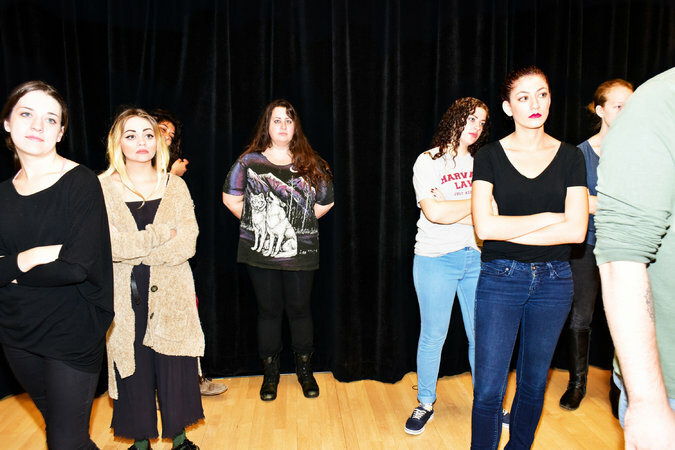 They had packed the Cabaret, a black-box theater in the basement of one of Emerson’s many buildings lining the Boston Common, with a full house of around 60 for their final show of the semester. Loud hip-hop blared in between sketches, as the group hustled on- and offstage, setting up a relentless series of bits — a depressed Jimmy Fallon contemplating his poor career choices, a time-traveling mystery set largely in an Olive Garden turning on the availability of free breadsticks, a willfully terrible Billy Joel impersonator absolutely ruining the enjoyment of everyone in the bar with his staccato, robotic take on “Piano Man” and Apple-store employees treating a woman who cracked the screen on her iPhone like they were detectives investigating her for murder. Another bit featured a character called Netflix George, a guy who was capable of bringing every conversation at a party, no matter how unrelated, back around to what’s currently on Netflix. “We don’t want to watch a movie at the party, Netflix George!” the others yelled. “Actually, they also have a lot of original television programming on there now,” he replied. The room, mostly fellow students, howled, some so loudly that it was hard to tell if they were genuinely laughing or just trying to support their friends and classmates. But at this point in their lives, there’s almost no difference. If you have a road that you’d like us to share let us know. You can contact us here or follow us on Facebook, Twitter and Instagram.